Your family and friends will feel at home in this brand new property. Enjoying outstanding, panoramic mountain and lake views. A modern, fully stocked kitchen with an induction cooktop, oven, fridge/freezer and microwave is perfect for cooking at this spectacular retreat. The deck off the living area provides the perfect spot to relax and enjoy the amazing lake view. With double glazing, heat pump and gas fire you will stay toasty warm in the winter months. Plasma TV, wifi and a fully equipped laundry provides you with all the comforts you need for your holiday stay. There is a master bedroom with a king size bed on the lower living floor with a modern, tiled ensuite. There are two bedrooms on the upper level, one bedroom with a queen size bed and a second bedroom with two singles - that can be combined to a make a king bed. Both bedrooms on the upper level share a modern tiled bathroom. 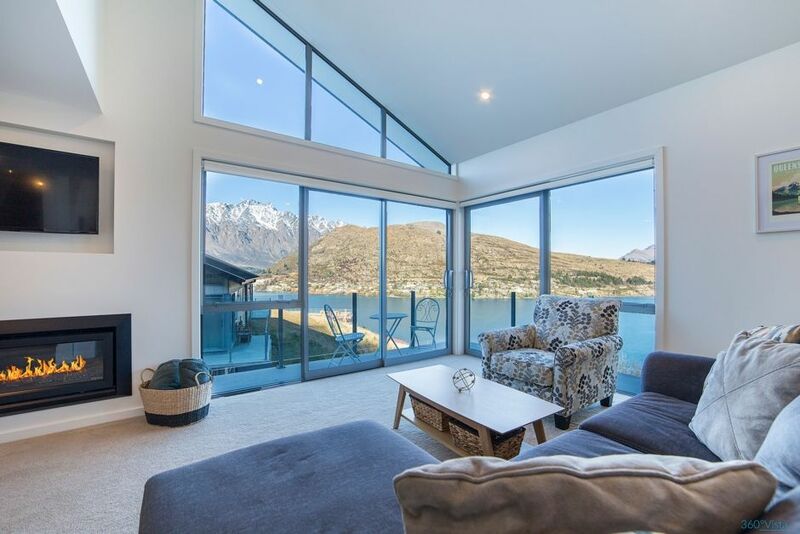 You will love staying at Wai View, only ten minutes drive into the action and excitement of central Queenstown, and a five minute drive to Queenstown Airport. For larger family groups why not consider renting our 45 Middleton Rd Apartment as well. 3 night minimum stay, except for Christmas/New Year when it is 5 nights. An administrative fee of NZD$25.00 also is charged on the accommodation only. Rates: Off -Peak Rate; public holidays - please enquire. Guest(s) making a booking must be over 25 years of age. Additionally, all guests who are unaccompanied by a parent or guardian must also be over 25 years of age. The house was great very cosy and homely. Great views and only 5 mins car drive to Queenstown. Thank you for choosing to stay with Harcourts Holiday Homes. We enjoyed having you and we look forward to welcoming you again in the future.